At some point in most people’s lives, they have dreamt or pined after ‘the’ country life. One pictures themselves in the middle of a Constable painting with a Turner sky as a backdrop, or maybe they imagine themselves waking early, maybe with the rooster’s crow, but of course rosters can and will crow at any point of the day if so they wish. People dream of cosy fires and walks in the rolling hills recounting the flora and fauna as their cocker spaniel bounds along beside them, and if you’re lucky, a muse which you didn’t know to exist, touches you. This theme of a slow and spiritual country life versus a speedy, soul destructive city life has been visited and explored countless times. You only have to visit the works of the Romantic poets to witness these comparisons. This idyll life is however not on offer to our narrator who finds herself venturing out in terra cognita, also known as the country side, with the hope of a new life, after all, that’s what country retreats are all about, so she thought. What she had not anticipated was her host, Cassandra, being a wild widow who insists on living off the land alone, banning bread and the most terrifying aspect of it all- the ‘thunderbox’ which is an outhouse to you and I, or really and truly, a pit to do your daily business in. Our narrator, who shall remain nameless, found herself, prior to ‘thunderbox’ life to be leading what one would consider to be an ordinary life. She had a decent job, a husband, a clean house with a gardener and the next step was a baby. But a baby, they discover was not on the cards and as a result of this minor glitch and lots of ‘ommmmm-ing’ through the checklist of life, her husband leaves her. Our narrator, in turn decides to leave her life. Kavenna is a fantastically hilarious writer with skepticism, irony and venom pouring out of her fingertips. Her writing brings a very interesting issue to the shimmering surface which is the contrast between those that have more than they need to those that don’t have at all. Cassandra tries to take back what the rich have taken (second homes) and give it back to the locals of the valley; the only flaw in this somewhat revolutionary plan is that it is entirely illegal. Our narrator who has always found herself swept along with life had hoped to find her own voice and break away, yet once more she finds herself in the role of an unwilling disciple to a cause she wouldn’t have ever thought of. 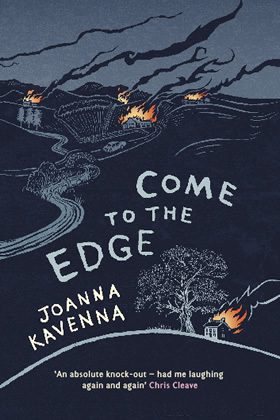 Kavenna invokes the spirit of Gibbon’s Cold Comfort Farm with the unrelenting cold, drab and dirty farmhouse along with “kooky” characters one tends to come across in rural settings. This is a beautiful, entertaining, satirical novel in which Kavenna’s writing speeds along at a swift pace only to throw into an unavoidable deep end.